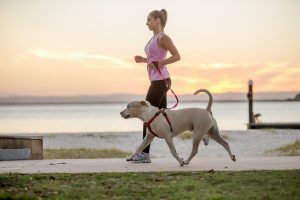 Regardless of whether you’re just trying to stay in decent shape, or you’re training for a race, your four-legged friend has the potential to be the ultimate running partner. They’re always available, will never stand you up and are always thrilled to get outside and spend some quality time with you. Through September we’ll be covering the topic of “Running With Your Dog” from a variety of angles to give you all of the information you need to have a fantastic running adventure with your best friend. Our first post covered the “11 Tips for Running With Your Dog” – a high-level look at the things to keep in mind when considering making your pooch your training partner. For our second post in the series, we’re going to cover the specifics around how to run with your dog. We’ll walk you through the training process, running details and fixing of common issues. Let’s get on with the run! 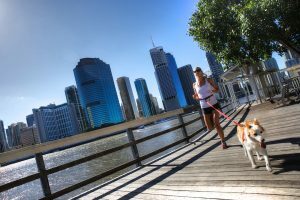 *NOTE – Before undertaking any serious running effort with your dog, please consult your vet to ensure your dog is physically capable. Also, serious running is not recommended for dogs under 12 months (or 18 months for very large breeds). Decide Positioning – Choose whether your dog will be on your left or right side. It doesn’t matter which (unless you’re competing in dog shows) so whichever is most comfortable. It’s important that whenever your dog is on leash..whether it’s for walks, runs or just a trip out to the car, that you keep them on this side. They need to understand that this is their on-leash place. Their front feet should be even with yours, or slightly behind. They should be 2-3 feet from you, with enough slack to have a slight U-shape in the leash with your arm in normal running position. Have your dog sit next to you, facing the same direction you are, in this position. Reward them frequently with treats (or small pieces of their regular meal) once they’re in the right position. Start a Power Walk – Aggressively start walking in a manner that’s clear you want your dog to follow you. A verbal clue (like “let’s go”) can be used but isn’t necessary. If he’s walking next to you in the right spot, reward with food. If he gets ahead (or in front) of you, stop immediately, with plenty of slack left in the leash. When the dog gets to the end of the leash, don’t let your arm move from your side, and don’t move forward. Eventually they’ll turn to see what’s going on – that’s when you lure them back toyour side with a treat and get them to sit again next to you. Give several more treats until his focus is entirely on you and he’s in the right spot, then start the process again. Continue this process until your dog realizes that getting ahead makes you stop, and being next to your side and focused on you gets the walk going again. Bring on the Turns – First, and easiest, is the about-turn. Stop abruptly and turn 180 degrees opposite the side your dog is on, and start walking again in the same line. Your dog will have to notice you’ve turned, and hustle-up to get catch up with you. As soon as they’re back in position next to you, reward them for the effort. Next is the U-turn. It’s the same 180 degree turn, but this time in the direction of your dog, putting them on the inside of the turn. This teaches him that he should stay by your side so that you don’t keep cutting him off. If you have problems getting around your dog, you can place your hand with a treat right in front of his nose so that he stops to eat the treat, then you’ll complete your U turn while you have him stationary and then head in the new direction. Bring It All Together in a Walk – At this point, your dog has learned to have good manners on a leash, now it’s time to make sure you’re putting them to use. 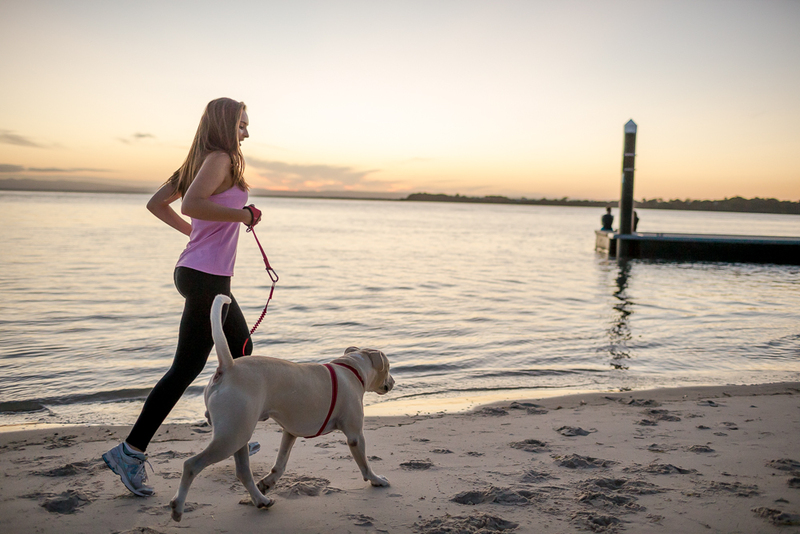 Ensure you’re walking your dog every day, and practicing all of the above fundamentals. Once you can take your pooch out for a 30 minute walk and they stay by your side and can handle both kinds of turns, you’re ready to start running with your dog. 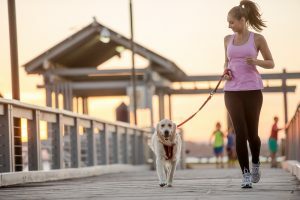 The First Run – It’s important that your first run(s) with your dog focus on their leash training, as opposed to focusing on your running training. For this reason, it’s recommended that your first runs be during their regular walking times. Alternate between fast-walking and jogging, focusing on keeping your dog on their best leash-manners at all times. Keep the dog on an even pace next to you and ensure you don’t let them take the lead. With practice, you’ll feel comfortable taking your dog out for longer runs, at this point you’ll have a running training partner ready to go! How far/fast should I run with my dog? Just like people, every dog is different. The key to understanding how fast/far to run with your dog is to read the nonverbal signs they’re giving you (see signs of exhaustion below). Start slow and increase the pace/distance over time as you see your dog’s cardiovascular endurance improving. Don’t increase either the distance or the pace more than 15% week over week. When you’re going on a run designed to push yourself very hard, that might be a time to leave your pooch at home. What are the Signs of Exhaustion? During or after a run, watch for these signs that indicate your dog has pushed too hard. If you see any of these, stop immediately and get your pooch to the vet ASAP. The most important thing to remember here is not to reward your pulling dog by continuing in the direction they want to go. If they start pulling, you need to stop immediately and stand still, or even head the other direction. Treats are a huge motivator for pulling dogs – keep them interested in being by your side by rewarding them with small treats when they’re in the correct position. 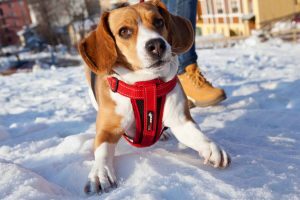 For dogs that love to pull, a dog harness can be an excellent option to get them under control and get them trained effectively. With the harness on them, you are in greater control of the dog and the direction they are going. Simple excitement about going for a run. In some cases this indicates a dog that may be under-stimulated outside of the runs. Find activities for your dog when not on a run – interactive toys, frisbee/tug for a few minutes several times a day or more frequent runs/walks. Even when adequately stimulated, some dogs still mouth the leash out of simple excitement about the run. In most cases, this is because they simply haven’t been taught different. You need to shift the leash to be a source of relaxation. Touch the leash on the table and reward your dog for not reacting. Lift the leash and reward your dog for not getting excited. Have them sit, attach the leash, and reward them for not mouthing the leash. These steps will transition their behavior to one that is more appreciated and calming for your both. Some dogs are simply “mouthy” and need to be carrying something with them, and the leash is the closest thing. 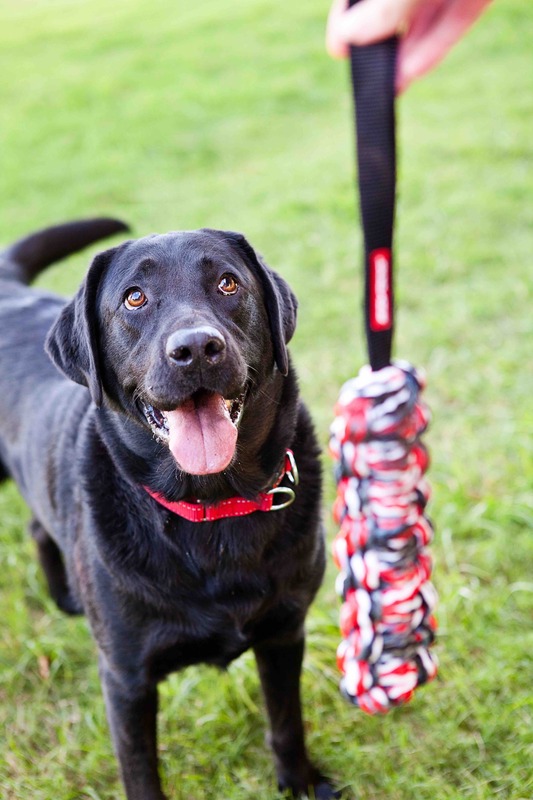 In this case, replacing the leash with something else is acceptable – a toy or stick they can carry. Be prepared to pick it up and pack it on your run though, it’s not likely to last long in their mouth! Start by ensuring their “business” is taken care of before getting into the serious running. Having a chance to do a bit of sniffing about and finding just the right bush to relieve themselves can address many issues you may encounter while on your run. Use this time as your “warm-up” for both of you to get ready for your run. Once your dog notices a trigger (a dog in a yard, a stranger across the street, etc. ), immediately start “happy talking” to your dog and delivering treats. Make sure the treats come a fter your dog notices the trigger. We want the trigger to predict the treats, so that your dog learns that the things he fears actually lead to good things. Reinforce calm behavior. 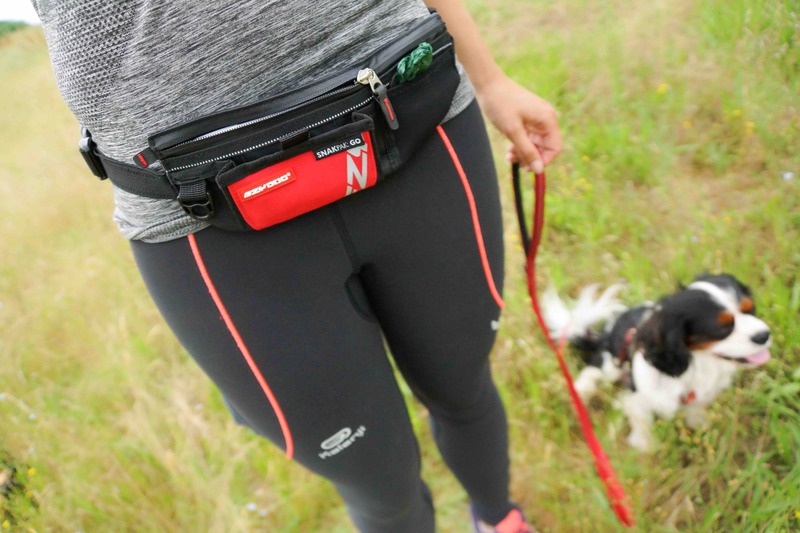 Use a treat belt to ensure you always have access to treats on your run, and reward your dog for not reacting negatively to their triggers. Dog harnesses are a great tool to keep control of your dog. Additionally, no-pull leashes can help to address the lunging issue and make sure you are guiding the run. 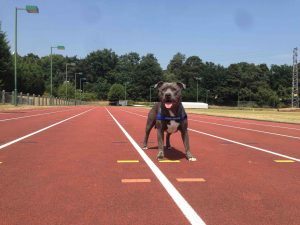 Training your dog to run with you will take an investment in time and energy (and certainly treats!) but that investment will pay dividends in having the best running partner you could ever hope for.